History Today ...from the Editor: Where Will the Hoard Call Home? Where Will the Hoard Call Home? A small but exquisite selection of objects from the Staffordshire Hoard go on temporary public display today in Gallery 37 of the British Museum today. 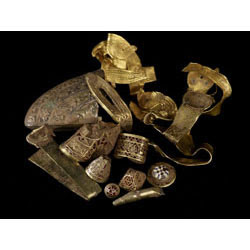 It coincides with the launch of the Portable Antiquities and Treasure Annual Report 2007, the scheme, unique in Europe, which made possible the acquisition, examination and evaluation of the hoard. The display also includes a number of objects whose discovery was recorded in 2007 including a Roman copper-alloy figure of Cautopates, one of the attendants of the god Mithras, who was popular with Roman soldiers stationed in Britain; selections from the 10th-century Viking Hoard unearthed in the Vale of York, including Carolingian, Islamic and Anglo-Saxon coins; and a medieval silver piedfort – possibly a reckoning counter for officials - from the mid-1350s and struck in the name of Edward III as Duke of Aquitaine. At the press conference, it was confirmed that the Staffordshire Hoard will find a permanent home in the West Midlands, though such is its size, the British Museum is always likely to have a selection on display. Staff from Birmingham City Museum and Art Gallery (BMAG) and the Potteries Museum in Stoke on Trent are working on those long-term proposals now. For curators, this is a once in a lifetime opportunity, as Rita McLean, Head of Birmingham Museums and Heritage, was eager to stress.